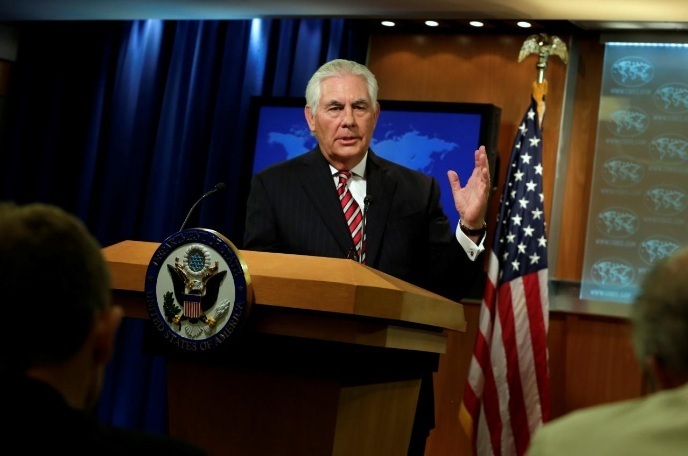 FILE PHOTO: U.S. Secretary of State Rex Tillerson speaks at a press briefing at the State Department in Washington, U.S., August 22, 2017. The White House on Tuesday downplayed talk of division among President Donald Trump’s advisers after Secretary of State Tillerson and economic adviser Gary Cohn appeared to criticize Trump for his response to the violence in Charlottesville, Virginia. In an interview on Fox News Sunday over the weekend, Tillerson said “the president speaks for himself” when asked about Trump’s values. Cohn, who was standing near the president in Trump Tower this month when Trump said there were “very fine people” on both sides of the demonstration that was sponsored by neo-Nazis and white supremacists, told the Financial Times in an interview that citizens standing up for freedom could never be equated with such groups. White House spokeswoman Sarah Sanders said on Tuesday that senior administration officials were not distancing themselves from the president despite the comments from Tillerson and Cohn. She said Trump’s relationship with Tillerson was “very strong” and that Cohn was committed to working on tax reform. “I think that ... at moments you have people that disagree, I think that’s a healthy thing,” she told reporters on Air Force One.